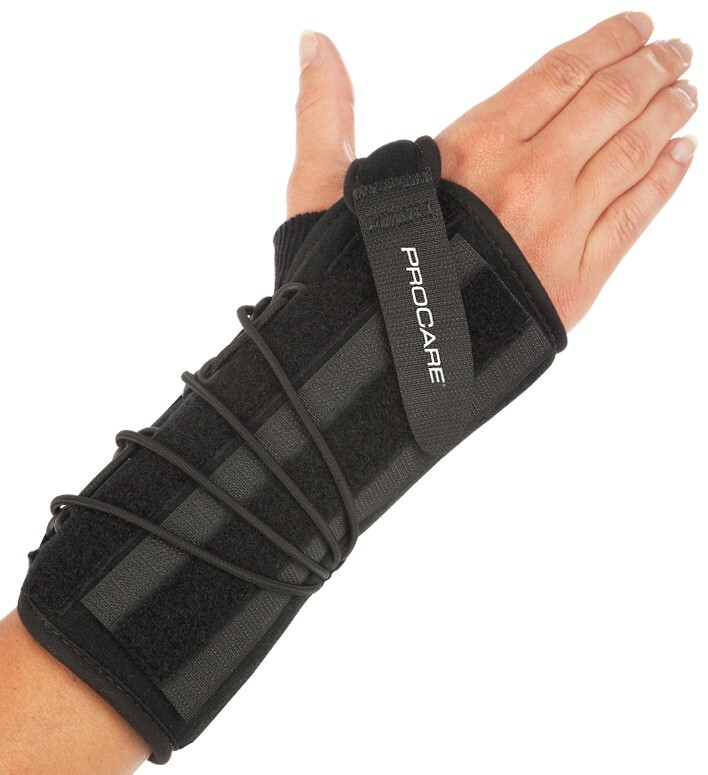 The ProCare Quick-Fit Wrist II is a universal, functional wrist orthosis for the support of wrist and hand injuries and trauma. A simple single pull lace design and stockinette tongue ease application while the soft nylon/foam laminate offers comfort. The Quick-Fit Wrist II has an adjustable, malleable dorsal stay pod that may be placed in the proper location for immobilization or removed completely during rehabilitation. A contoured palmar stay provides proper anatomical fit allowing full finger dexterity and may be contoured as needed to address a variety of indications. Universal for most wrist sizes 10" and under and Universal XL for wrist sizes 10" plus. Left and Right. Patent pending. The Quick-Fit Wrist II is highly recommended by orthopedic doctors and surgeons. Wash with light detergent and rinse with water. Air dry. U 8" Up to 10"
Will I be able to do back handsprings in these if not wich one could I do one in? Hi. I am wondering where I can find wrist braces in different colors? Like pink, blue, purple. Please let me know. My daughter has a bump on her wrist but would like to wear a different color. I just had reconstructive surgery on my wrist. Had total dislocation. Had 3 pins in wrist. I'm about 6 weeks post surgery. Have had plastic immobilization splint on. Will be returning to work soon. Plastic splint won't cut it at work. Which splint would you suggest? Either the Quickfit Wrist II or the A2 Wrist by Aircast. Both have a aluminum stay on top and bottom of the wrist. The A2 is a little cooler than the Quickfit. Will this brace be enough to support my recently broken arm while playing sports? This product will not work for a recently broken arm. This brace is usually worn after getting out of a cast 6 weeks after the break. I had a boxers fracture and need support while working. Will this brace be the best one to choose for that? The Quickfit II Wrist brace comes down on the hand so it should be supportive enough for a healed fracture. I workout a lot and do a lot of pushups, bridges, etc... My wrists are weak and my thumbs also get strained from trying to compensate. Would a brace like this help? I see so many on this site and I'm confused as to which one would be better. If you want to wear the braces while working out then take a look at the DonJoy Wrist Wraps. You can still get the use of your hands while wearing these. Just a great product, not really mention for exercising, but this does a better job than any brace I have tried., and I have tried them all. Being a weightlifter for many, many years, last year I hurt my wrist and tried a dozen or so wraps and different things. Since I have found this I can do everything I did before but just use lighter weights. This is the best support brace I have found and does interfere with me doing exercising. Great product. Most important no pain. The orthopedic doctor sold this thru medicare last year and close to 80.00. you sell the same product for $18,99. By the way I bought two pair, left right for the gym and the other for my exercising room downstairs. Exactly what I needed at a fraction of the prescription cost. I just received my brace yesterday and it is perfect to stabilize my post operative broken wrist. It offers great support and comfort. Sleeping has been a real problem since my accident but the brace really stabilized my arm and wrist during the night. My pain level was much better. This brace is a great brace. The problem I have is that there is Velcro everywhere and it sticks to everything. If I wear a sweater, it sticks to the clothing and inevitably there is a snag. I don't understand why it needs so much Velcro--there are only two area where you need to attach it. Excellent brace at magnificent price. I actually use this brace for additional immobilization for tennis elbow. Before I started using this brace to immobilize my wrist and was only using an elbow aircast strap, the excruciating pain would not go away. Now, as long as I remember to wear both braces when I will be doing any lifting or extensive driving I am virtually pain free for the first time in years. Cons: It can be a little warm to wear. Hard to write with it on. Excellent brace. Very comfortable, yet does a great job of immobilizing your wrist with metal stays on top & bottom. My only issue is the 'thumb strap' has sharp edges - I trimmed it & wrapped it in medical tape. Pros: Comfortable. Excellent support. Immobilizes wrist very well. Cons: Sharp edges on thumb strap. I fractured my wrist and, unbeknownst to me at the time, my insurance through my work had expired 4 days before! Because of administrative lapses, I couldn't get my Medicare Part B situated until much later in the month. So, not knowing what I was facing "cost wise", I decided NOT to go to the orthopedic doctor until I had my insurance straightened out. The Urgent Care Center had put one of these on me the day I went to them and it was working well, so I ordered another to have a change now and then. It has been absolutely great and I am healing VERY WELL! I do NOT recommend this scenario to others, but after looking at my Xrays, I thought this would work for me. And, it HAS! Pros: Adjustable for a personalized fit, especially when swelling occurs. Comfortable. Great stability. Very durable. Easy to clean. Cons: Needs padding in the knitted material underneath the elastic straps. Well made. Fits right. Works well. I fractured my wrist and the emergency room gave me the wrong size brace. So I ordered the right size and am very happy with the product and the wonderful service from this company. Pros: Lightweight. Easy to put on. Washable. No irritation. Well designed. Cons: Manufacturer's instructional photos are unclear since the product is dense black. Drawings would be more helpful.